In the world of grilled meats, barbecued boneless prime rib roast comes pretty close to nirvana. Especially when stuffed with chorizo, carrots, and tangy provolone cheese. Set up your grill for direct grilling, get the temperature just right (about 400 degrees F) and you’ll wind up with a roast that’s crusty brown on the outside and succulent, tender, and pink on the inside. Keep the seasonings simple (salt and pepper) so you can concentrate on the beef and the stuffing. Thank you, John Mooney, for reminding us about the recipe. 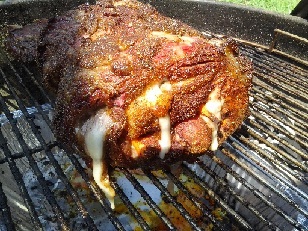 Just had great success with your chorizo, provolone, and Romano larded rib roast. It was sick! I wasn’t sure about the carrots but I trusted you. Then when I cut the steaks I saw the genius in their architectural necessity. And they provided a crunchy contrast as well. Everyone at the table was meat giddy!